SWL student Jesse Withington with Melville Panels Operations Manager Mark Ivkovic. Jesse Withington is a Year 12 student at Craigieburn’s Mt Ridley College. She is completing her Senior VCAL in 2017 and has enjoyed jumpstarting her career in the automotive industry with the opportunity to work one day a week during terms two and three, doing her Structured Workplace Learning (SWL) placement at Melville Bodyworks in West Brunswick. The on-the-job experience has enabled Jesse to apply skills she has learnt in her VET course, a Certificate II in Panel and Paint undertaken at Kangan Institute in Docklands. The course is held on Wednesdays and Jesse rounds out her week spending Fridays working at the busy bodyworks business, fulfilling a childhood dream to work in the car repair industry. Jesse found her work placement on the SWL portal, a website listing businesses that are happy to host VET students and give them practical industry experience. “My teacher, Ms Davies, takes all the VCAL students through the Structured Workplace Learning portal and shows us how to search for placements. It’s really useful, if you find a business on the SWL portal then you sort of know you’re in a bit of luck,” Jesse said. 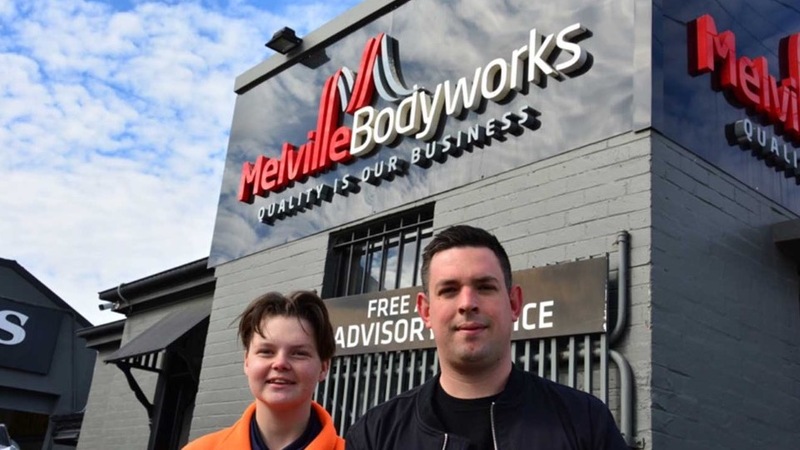 Melville Bodyworks offers to host students on work placement as part of its desire to nurture the next generation of talent and open the door for a young person to gain a foothold in the panel beating industry. Melville Bodywork’s Operations Manager Mark Ivkovic is committed to bringing apprentices into the business and is always on the lookout for talent. Working in partnership with the work-placement team at the Inner Northern LLEN and offering SWL opportunities to VET students has opened up new avenues of finding the people with the skills he needs. It also gives Mark a chance to look at prospective new employees. “Finding the right people for our business is really important. I’ve advertised for apprentices and don’t get a great response, so working with the schools to bring in younger people helps us find the talent we need,” Mark said. Melville Bodyworks supports their younger staff throughout their apprenticeship and often holds onto their apprentices once they are finished. This retention is critical to the business’ success and also allows it to incorporate staff who are at all levels of their careers into continuing apprentice training. A graduated apprentice, Harry, finished his apprenticeship two years ago and has been supervising Jesse throughout her placement. “Jesse has been fantastic. She’s really switched on and we always make sure we have something interesting for her to do, “Harry said. Jesse has been offered a full-time apprenticeship as a result of her SWL experience. Congratulations to Jesse and the team at Melville Bodyworks.